My grandma taught me to crochet when I was young, but I didn't do anything with it. Many years later a woman at work was working on an afghan and everything came back to me. I began getting magazines at the store when they were available - back in the early 90s the magazine sections were seriously lacking in the creative arts area. Fast forward a bit to 2005. 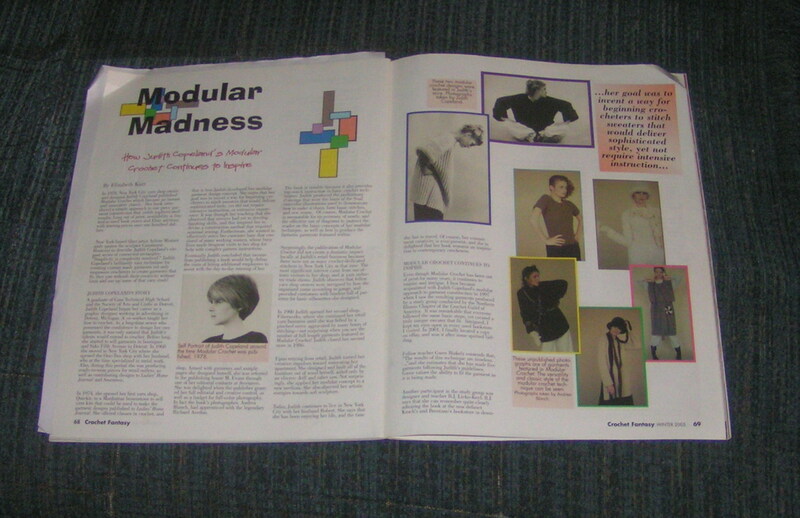 The winter issue of a magazine called Crochet Fantasy had an article called Modular Madness. The pictures really got my attention - the models looked so cool and 70s. The article was interesting and really got me when the author said that the book, Modular Crochet, was available sometimes on ebay for over a hundred dollars. I had to see it. My library got it for me through an inter-library loan and, well, I fell in love with it...so much so that I photocopied every page and put it in a binder to look at all the time. I made five sweaters from the instructions in the book and eventually found a copy on Amazon for thirty dollars. Now I have my binder copy and an actual hardcover copy that both get pored over regularly. Where am I going with this? Well, last summer I got a kit with a pattern for an oversized pullover and yarn from an online shop. I started to work on it and wasn't feeling it. The yarn was nice and the stitch pattern was cool, but the top wasn't working for me. It clicked in my brain to open my book and make a modular vest. Perfect! It worked up fast was fun to make. The yarn is a blend of alpaca and acrylic, so it's very light but warm and keeps my middle warm. I still have some of the yarn left. It may become a hat or scarf or something...or it may rest in my stash until the perfect project comes along. Kezzie asked to see the boot cuffs. I've worn them all several times, so they're a bit stretched. I somehow managed to make one of the cabled ones longer than the other. It doesn't show when it's in my boot, though, so I'm not going to remake it. 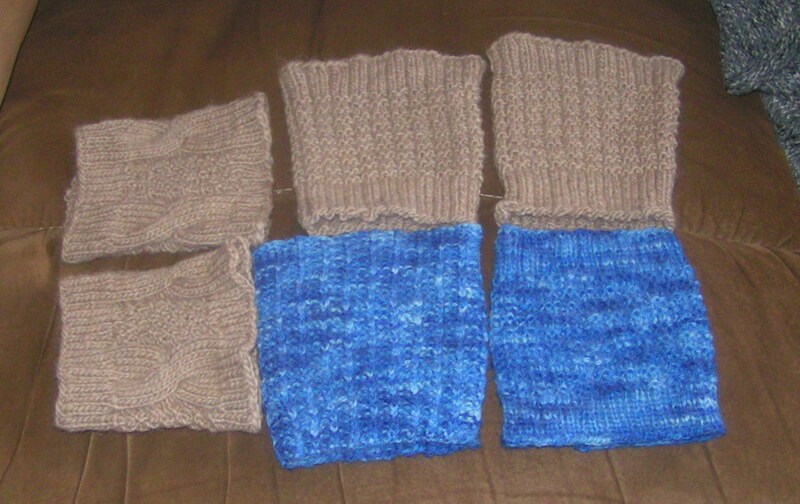 The blue yarn is from New Zealand. Several years ago I sent some Easter egg dye to a woman who wanted to use it to dye yarn with her daughter. She sent the yarn as a thank-you gift. It's beautiful. I have a bit left that I had to hide from a certain kitten who thinks it's a toy. I have plans to make more, but right now I'm struggling through a pair of socks for Khloe to give to a friend. I did make some hats for the march last weekend. The yarn store in Peoria was collecting them to hand out, so I took them in. I saw a picture of someone wearing one of my hats. It made me really happy. I'm not going to get any more political than that. Well, I'd better get back to that sock. It was supposed to be for Christmas. Oops. Oop,s haven't been here in ages! Missed your lovely sharing of the, frankly brilliant, boot cuffs AND the amazing tank top! I can see the family resemblance between you and Khloe!